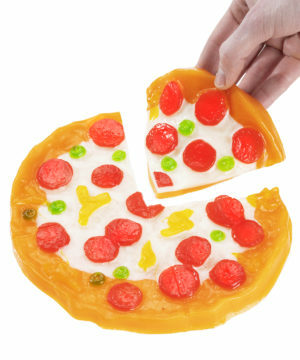 Grab a slice of sugary perfection with Gummy Pizza, an eight-inch gummy pizza that looks like the real thing. Every ingredient that makes up this sweet pie is a unique gummy flavor, starting with the crust (orange) and cheese (strawberry-banana) all the way to the toppings: pepperoni (cherry), green peppers (apple), and yellow peppers (citrus). Now, who’s going to be the one that gets the last slice? 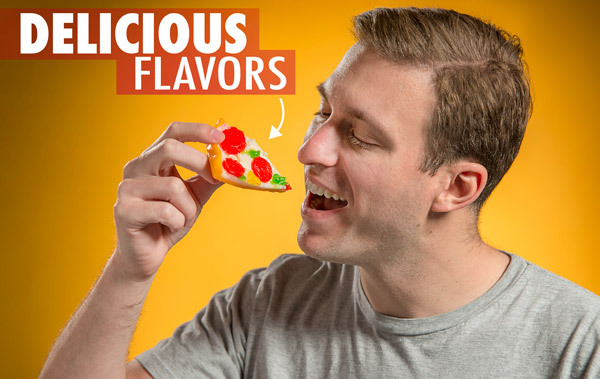 Speaking of slices, Gummy Pizza in a Box is also available as an equally awesome and nearly equally sized individual Pizza Slice (for when you've got the craving for a gummy pie and you want that wedge). For those who prefer a spicy pizza, try pairing it with Spicy Gummy Peppers. Please note that Gummy Pizza is no longer shipped in a cardboard pizza box due to issues with damage in transit. Just like every good pizza commercial suggests, you need to pair that za’ with some soda. Click the "Ultimate Meal Deal" option to add two gummy colas to your order! *There is NOT a discount with this option, it is just a fun suggestion to get the party started. What happens when one of the most popular foods on the planet collides with one of the most amazing types of candy? 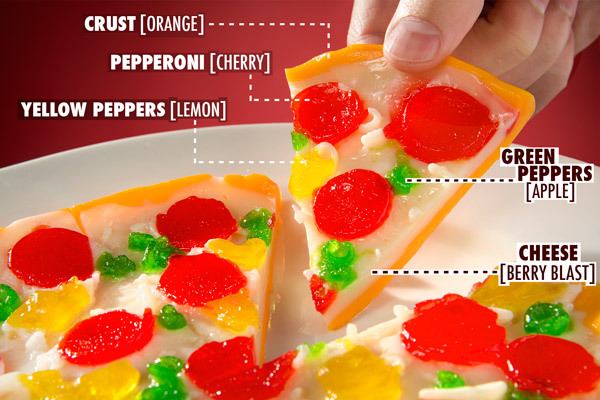 You get the incredible Gummy Pizza — an eight inch confectionery marvel! Or try a take-out Slice, which is just as awesome (and just about as big)! 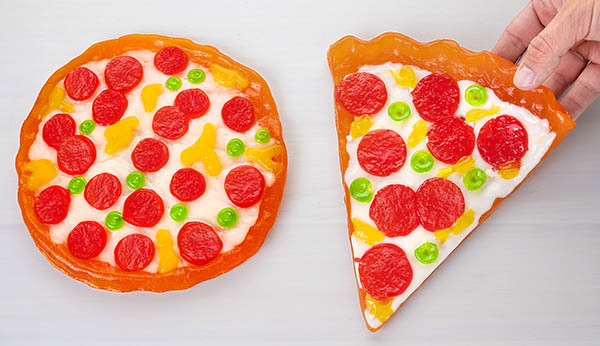 The gummy pizza looks like a real za’ straight from the oven, but the taste is a gummy explosion with fruity flavors in every bite. Who will get the last slice? Hey! Now that’s a tasty gummy! Don't feel like you could polish off a whole pie? No problem! 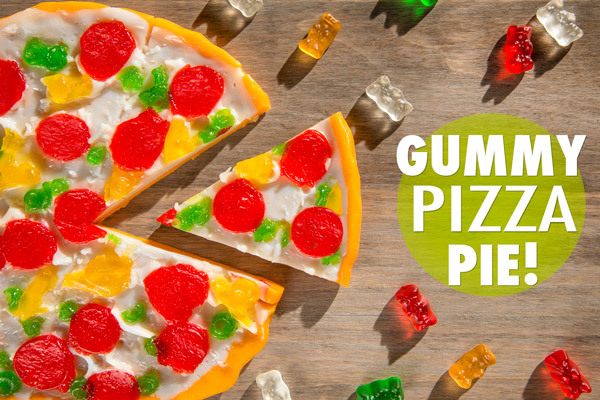 Opt for a slice of Gummy Pizza instead. This triangular treat is actually almost the same size and has the same flavors as the round pizza, so you'll probably still want to share the slice or savor it over a few different sessions. 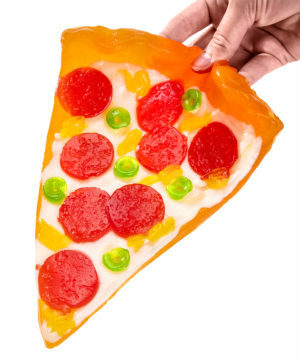 This take-out slice is another awesome way to devour delicious gummy pizza! Available in whole pie or slice! Question: Does the pizza taste like actual pizza? Answer: No. While it looks like real pizza the flavors are: crust (orange), cheese (strawberry-banana), pepperoni (cherry), green peppers (green apple), and yellow peppers (citrus). Sorry, no marinara here. Question: Which is bigger: the whole pizza or the pizza slice? Answer: The Gummy Pizza and Gummy Slice both weigh nearly the same and contain about the same amount of Calories. Aside from the distribution of flavors (the Gummy Slice has bigger pepperoni slices), they're identical ingredients crafted in two different delicious styles, so which one you choose comes down to your preference. Answer: Corn syrup, sugar, gelatin, citric acid, sorbitol, natural & artificial flavors, FD&C Red #40, Blue #1, Yellow #5, Yellow #6, titanium dioxide, vegetable oil, carnauba wax, canola oil, lecithin from soybeans, water, rosemary extract. Contains soy.